You’ve built your paper GT86 and Prius, right? So now the third model in our papercraft series for you to build at home is the Toyota RAV4. 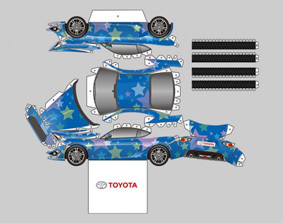 Add the papercraft Prius to your collection – it comes in three different colour schemes. Download and build your very own GT86 out of paper – it’s available with three striking paint schemes. You can now view your Toyota Verso Owner Manual online. New Versos will no longer be delivered with full printed Owner Manuals. Instead owners will instead have a 160-page user guide. The Land Cruiser has an enviable reputation for excellence in the Dakar rally, and now you can build one out of paper. Underpinned by thirteen core processes and philosophies, The Toyota Production System pioneered modern manufacturing as we know it. Here’s what each one is and how each one works. How do the Toyota RAV4 all-wheel drive systems work? We look at the sophisticated controls behind the Toyota RAV4’s all-wheel drive systems, which helps the car juggle on-road economy, safety and off-road capability. With Toyota Touch & Go, you can make a detailed plan of your journey using Google Maps, and then send all the locations straight to your car.